Arcing power line on US 14 and Davis Street in Arlington Heights, including scenes from I-90 near Rolling Meadows, power out downtown Arlington Heights, a tree down on Arlington Heights Road north of Oakton Street, and a drooping phone line Mobil Station on Golf Road. Electric power problems started in Arlington Heights Sunday, November 25, 2018 about 90 minutes after a Blizzard Warning from the National Weather Service was in effect. Following sleet and light rain with a Winter Storm Warning in effect, Sunday’s storm was upgraded to a Blizzard Warning for Lake County at 11:27 a.m., and Cook County at 3:32 p.m. 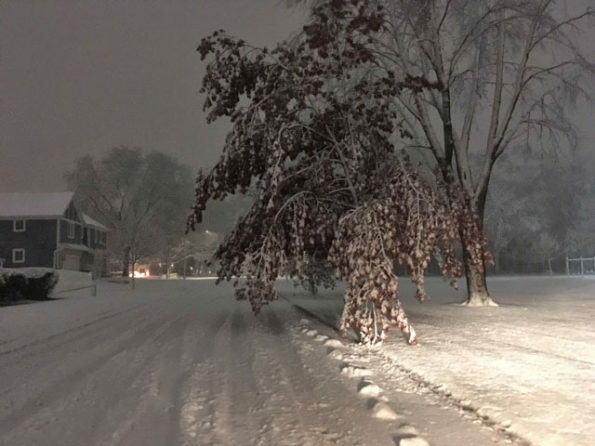 The storm presented blizzard conditions with over 8 inches of wet, heavy snow and wind gusts up to 50 mph in Arlington Heights, leaving damage trees and ComEd power line and equipment damage in a widespread area in northern Illinois. The wet snow stuck to tree limbs, which quickly began to sag or snap. 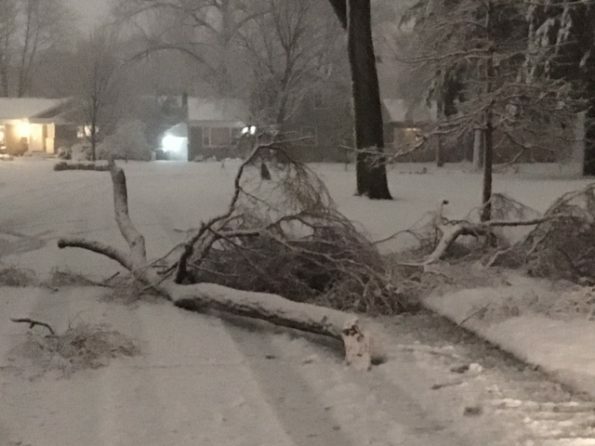 Because of especially wet, sticking snow combined with high winds, electric power assets managed by ComEd in Arlington Heights began to be damaged in a series of frequent incidents about 7:30 p.m. Sunday. Across Chicagoland, residents experienced snapped tree limbs and downed power lines. Some power line service drops were pulled away from houses. Other power problems involved more main line equipment that affected entire neighborhoods. Arlington Heights officials on the official website vah.com said the Village of Arlington Heights was the second-hardest hit community following the City of Chicago. Power flashes were observed in neighborhoods at a frequency that was unlike any other recent storm in Arlington Heights. Following a day of sleet and light rain, sleet and snow with large, wet flakes were in full force about 5:30 p.m. No accumulation on pavement had initiated as of 6:30 p.m. in Arlington Heights, but about 1 inch of very wet, sleet-like snow was on grassy surfaces at 6:30 p.m. Heavy, wet snow began accumulating quickly after about 7:00 p.m., but by 7:45 p.m. one inch of snow accumulated on pavement and stuck to tree branches. 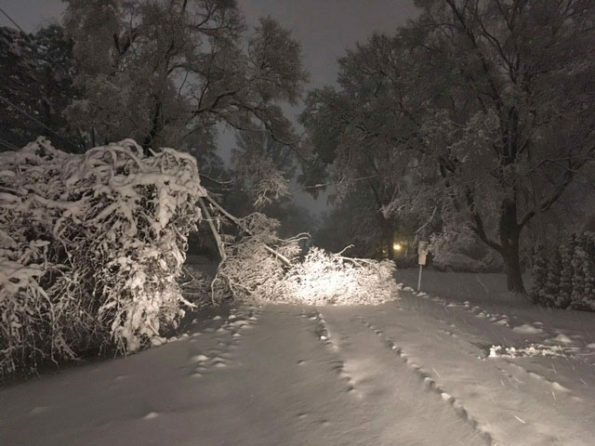 The electric power trouble started in Arlington Heights 90 minutes after the Blizzard Warning went into effect at 6:00 p.m., with reports of arcing lines, often connected to tree damage. The first call of a series of calls that continued into the night, overnight, and all day Monday was a report of a line sparking in the block of 400 Chatham Place at about 7:31 p.m. Almost simultaneously at 7:33 p.m., the next call for help was in the block of 2100 North Vail Avenue for an arcing power line brushing up against a tree. At 8:02 p.m. Mount Prospect firefighters responded to a primary line down and a report of an electrical box explosion and light pole down near a stoplight at Algonquin Road and Briarwood. Arlington Heights firefighters were called back to Chatham Place and Northwest Highway at 8:10 p.m. for the same arcing line. At 8:26 p.m. firefighters responded to the block of 1800 North Vail Avenue to a report of a power line on a tree that was burning. Multiple power flashes were lighting up the sky by 9:00 p.m. in all directions. Firefighters were basically dispatched to check for hazards and emergencies that might cause injuries or serious fires involving structures. Fortunately, no power line emergencies caused any structure fires in Arlington Heights. Mount Prospect firefighters responded about 9:35 p.m. to a possible shed fire that was caused by a downed power line. When possible, firefighters pinpointed the electric problems, identifying the exact address or asset numbers of transformers or power lines that were damaged. At 9:50 p.m. Sunday firefighters were dispatched to a downed high voltage line with arcing and fire at Northwest Highway and Davis Street. Firefighters on arrival confirmed a fire with a downed primary line across Northwest Highway just east of Gibbons Avenue and requested police to shut down Northwest Highway. The fire was on the south side of Northwest Highway. At 11:29 p.m. Arlington Heights firefighters responded to an arcing power line at Rand Road and Waterman Avenue, about 1.5 mile north of the Northwest Highway arcing line incident. Prospect Heights firefighters had already been on the scene of the downed line on the south side of Rand Road, west of Waterman Avenue. The line was arcing from Sunday night until at least 3:30 p.m. Monday afternoon, and several people called to report the arcing line with fire throughout the day Monday. Downed power line arcing on the south side of Rand Road just west of Waterman Avenue, Prospect Heights near Arlington Heights. ComEd officials reported that at the peak of outages, about 363,000 ComEd customers lost power in northern Illinois. About 112,000 customers in northern Illinois still were without electricity as of 5:00 p.m. Monday. More than 5,000 people lost power in Arlington Heights as large areas went dark, involving whole neighborhoods or about half of neighborhoods. Tuesday morning, ComEd crews were continuing to work to replace damaged assets and return electric power service to all people. As of 7 a.m. in Chicagoland, 46,500 ComEd customers are without power, with most outages north of Chicago and occurring especially in the northwest suburbs. The Village of Arlington Heights reported Monday that the fire department received 100 calls for reports of electrical, storm-related incidents and that the public works department received 65 calls of trees down. The majority of the power outages were reported in Cook County, where about 28,000 customers did not have power early Tuesday morning. In DuPage County, about 11,000 ComEd customers did not have power early Tuesday morning. In Lake County, Kane County and Will County, about 2,000 customers did not have power early Tuesday morning. ComEd reported that crews were in the field assessing damage and preparing to restore power as soon as conditions are safe. ComEd assigned priority to restoring power to emergency facilities, hospitals and nursing homes. More than 800 ComEd and contractor crews were working Monday, November 26, 2018 to restore service to all customers, according to ComEd. An additional 250 employees and contractors from ComEd’s sister Exelon energy companies were assigned to provide assistance to northern Illinois to help. Several businesses along Rand Road between Palatine Road and Camp McDonald Road, and in sections of downtown Arlington Heights were also closed late Monday because of interruption of electric power service. Residents and business owners can check on the status of power outages any day of the year by viewing ComEd’s outage map or by entering a specific address. ComEd’s official Twitter and Facebook feeds are also important sources of information, and ComEd customers can also text STAT to 26633. Arlington Heights officially advised that residents should stay with friends or relatives, and should call the police front desk at 847-368-5300 if they have mobility or transportation problems. The village also reminded residents not to hesitate to call 911 if they were experiencing a problem that requires an immediate response. The Village of Arlington Heights stated that a warming shelter at the Senior Center, 1801 W. Central Road, was open until 8 p.m. Monday, and reminded residents that the Arlington Heights Memorial Library, 500 N. Dunton, is open until 10 p.m. No overnight shelters were established by the Village of Arlington Heights. The Chicago official low at O’Hare was 24°F just before midnight on Monday, November 26, 2018 while temperatures continued to drop overnight to a low of about 22°F from 2:00 a.m. to 8:00 a.m. Tuesday morning. Tuesday’s high was expected to only reach 23°F, and the temperature is forecast to drop to 13°F Wednesday morning about 5:00 a.m. to 6:00 a.m.
Tree down across Olive Street near Windsor Drive. Tree branch down Clarendon Street just east of Douglas Avenue in Arlington Heights. 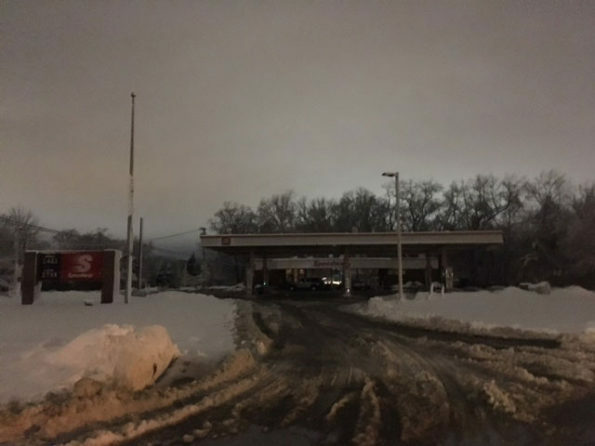 Speedway gas station and convenience store with no power Monday night at US 12 (Rand Road) and Waterman Avenue, located across from arcing power line after blizzard.